Yes, the post you've all been waiting for. Before reading my take you should of course read RealClimate, but I suspect like me you'll be a touch disappointed, because that post is bland. I shall quote from it: The summaries and FAQ are good, and the ClimateNexus briefing is worth reading too. The basic picture is utterly unsurprising, but the real interest in the NCA is the detailed work on vulnerabilities and sectorial impacts in 10 specific regions of the US. The FAQ is also unsurprising if you know this stuff, but does include a ref to our ice-age myth stuff, which is nice. 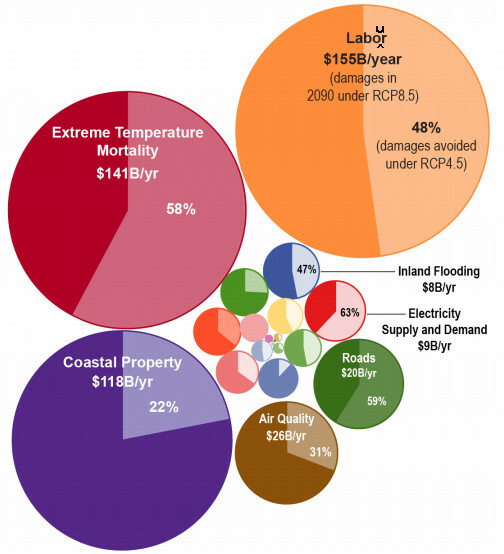 As you'll see, the three biggest impacts on that graph, as measured by dollars, are: Labour, Extreme Temperature Mortality, and Coastal Property. To a first approximation, each of those are a quarter, and everything else is another quarter. I was going to do Labour, but the first one along was ETM, so I thought I'd do that instead. Note first that The study also only considers deaths related to extreme temperatures, though extreme heat will... do other stuff too; so this isn't complete. $141B/yr is a Big Number, but we all known that Big Numbers without some kind of context or referent are meaningless. Let's try to put it into place. As the report says, This analysis estimates the number of deaths over the course of the 21st century attributable to extreme temperatures in 49 cities in the contiguous U.S., which account for approximately one third of the national population. So that's a bit funky: you might at least expect them to multiply it by three or something. That number - by 2090 - represents 9,300 deaths/yr which is ~$15M/life by a quick in-my-head calc; and looking at footnote 142 I see I'm right. Soooo... how might we assess that? Imagine (I do this just to wind you up, you understand) we were talking not about people, but about industrial plant. Then we'd want to compare those 9,300 people to the replacement rate; which is currently abut 1%, of about 300M, which is to say the population is growing by 3M/yr. Against which 9,300 is about 0.3%, if I have my maths right. Scaling that, we might expect a similar number from the GDP figures: $141B is large, but the US GDP in 2018 was ~$20Tr, of which $141B is about 0.7%, which is close enough, as I haven't been very careful about what year I'm looking at. The next interesting thing to consider is Mortality from extremely hot days decreased more than 50% under both RCP8.5 and RCP4.5 in 2050 and 2090 when the human health response to extreme temperatures was evaluated using Dallas’ threshold for extreme heat (in all cities with thresholds initially cooler than Dallas), as a sensitivity analysis to consider the effect of adaptation. Which is a good place to remind ourselves that, for simplicity, the initial figures are with no adaption, a not very plausible scenario. Unfortunately they don't really explore Dallas-world in depth, so it is nothing but a sensitivity analysis; but if you think $141B is large then you presumably think $70.5B is also large, and so should be very interested in exploring an effect that large. If you follow the spiral of bubbles down to near the centre you'll eventually come to "shellfish" at $23M/yr. Now I quite like shellfish, some of my best friends are shellfish, but compared to the uncertainty in $141B, 23M is less than a rounding error, so why they bothered - other than pressure from the shellfish associations - I really don't know. I should also point out that these are RCP8.5, which you can call too high if you like, and can consider RCP4.5 if you prefer, in which case you get to cut the numbers in half. Update: I didn't explicitly note it here, but their estimate of the (small) changes due to winter mortality don't look plausible to me, especially in the face of stuff like Excess winter deaths in England and Wales highest since 1976 from the Graun. * The management apologise for any inconvenience - aka Estimating economic damage from climate change in the United States by Solomon Hsiang et al., Science 30 Jun 2017. Page 48 suggests it is 9300 deaths per year (not 9500 deaths in total). I suppose the 'per year' is obvious but this and things like "US GDP in 2018 was ~$20B, of which $141B is about 0.7%" (presumably that is meant to be 20 trillion) doesn't help comprehension. Reading things like"(I do this just to wind you up, you understand)", I was sort of expecting you to write things like: This shows value per person is taken to be an average but the sort of people to die from heatwaves are likely to include disproportionate frequency of frail elderly people with short expected lifetime and quite possibly retired so not contributing much to society and so rather than an average cost, there could be savings in looking after them. How you are supposed to address such issues in a politically correct manner beats me completely. I've corrected 9,5 to 9,3 and to /yr to avoid confusion; ditto 20B to 20Tr. Unless I've missed it, they do deal in deaths, rather than QUALYs, which is probably another mistake. I shall not worry my pretty little head about PCness too much. QUALYs are quality of life, but does that adequately encompass what is wanted in this situation? If someone is doing a job with high value and they die, they will probably be replaced by someone else. If the replacement person is likely to do the job as well then perhaps instead of average value it is more like some sort of marginal value of an extra life. If they do it less well then maybe average value is some sort of reasonable approximation. If there is a short period where they are less good then .... So even for working people, average value seems likely to be an exaggeration to me. Are you going for economic or moral value? As far as I can tell, the report makes no attempt to "weigh" deaths by value of the life, it just assumes all are equally valuable. Anything else would probably be too controversial. I would guess, though, that it's the plebs that are going to suffer: the high-value-job people will have AC and other amenities. So in a pure economic sense the cost is probably much less than they're saying; could even be a benefit. I don't see the point of trying to put a cash value on extreme heat mortality figures. If you're trying to measure impacts, or SCC, there's no real alternative to turning everything into a common currency. Actually there is an alternative, but IMO it is a bad one: to declare that many deaths morally unacceptable, insist that policy must prevent them, and effectively give them infinite value. But why would you privilege that kind of death? We don't apply that kind of argument to death-by-car, or death-by-other-things. Inasmuch as analysis of prior heatwaves point clearly to premature 'harvesting' of the moribund, chopping roughly 3 to 6 months off their lifespans, clearly some sort of common currency, as our host puts it, will be needed. Cold is in the report. But the numbers are so small they don't really affect the result. Possibly implausibly small; I didn't look too carefully. Perhaps it's just a rumor, but I had heard that it's possible to represent data in more than one dimension. It might even be possible for humans to comprehend such a thing. Money is a very convenient proxy for property losses and incurred expenses. It's not a very good one for loss of life, extinctions, and certain other losses. I am happy to agree that life is a complicated multi-dimensional affair, with only the reservation that it may be too complicated to reduce to even an infinite number of dimensions. I certainly do not judge all things purely by their monetary cost; and neither does anyone else. However, when doing stuff like calculating the social cost of carbon, or appraising damage as in this report, in order to compare things you do need to reduce them to a common unit. I struggled against this for a long time because it misses imponderables; but there is no alternative that isn't worse. You can if you wish propose a better alternative. I don't see the point of trying to put a cash value on extreme heat mortality figures." Unless you need to work outside, of course. Money talks, but nature always bats last. That $110 is the cost of pinning the ever-increasing airborne fraction firmly onto the hope that the power-lines connected to your life-saving AC have not been Puert-Rico'd. For the purposes of dimensional analysis, it'd be an interesting exercise in monetary linguistics to air-condition the worlds rice paddies and favelas. Agriculture (well, and the natural world) is an obvious risk of damage. Quasi-insanely, the report comes up with $12M/yr for "agriculture", which I struggle to understand. The EPA source doc (Table 21.1. Cumulative Change in Welfare) does indeed seem to support that, with values of ~$190M (but that's cumulative, not annual, I think). Part (but only a factor of two) in the answer is " decreases in crop yield and the resulting price increases result in cumulative gains in producer surplus through the end of the century". I find myself doubtful that the analysis is worth anything, in this area. It's tough for the people (well, under GW or under present day) but economically, nearly by definition, they aren't going to be a large number.